According to the latest data released by market research firm Gartner, the Finnish giant Nokia falls down from third to seventh place in the global Smartphone market in the third quarter. Market leader Sasmung is on the first place and iPhone manufacturer Apple is on second place. Gartner said that Nokia was “particularly bad quarter” in terms of Smartphones, having sold only 7.2 million Smartphones and 82.3 million mobile phones. A year earlier, Nokia sold 105 million devices. “The arrival of new Lumia devices with Windows Phone 8 to the market should help Nokia to reduce the rate of decline in the fourth quarter, although we do not expect 2013 to significantly improve the company’s position,” – said Gartner. Analysts say that Nokia is now beginning to sell their flagship devices Lumia 920 and Lumia 820 through operators around the world and by the end of the current quarter will be seen what effect can be expected from this release. Nokia continuously loses its Smartphone market share also falls down his position since he chooses a Windows Phone platform instead of Google’s Android. platform. Gartner expects the Finnish company’s new Smartphones will be sold well in the pre-New Year season, and this will affect the market share of the Finnish manufacturer. 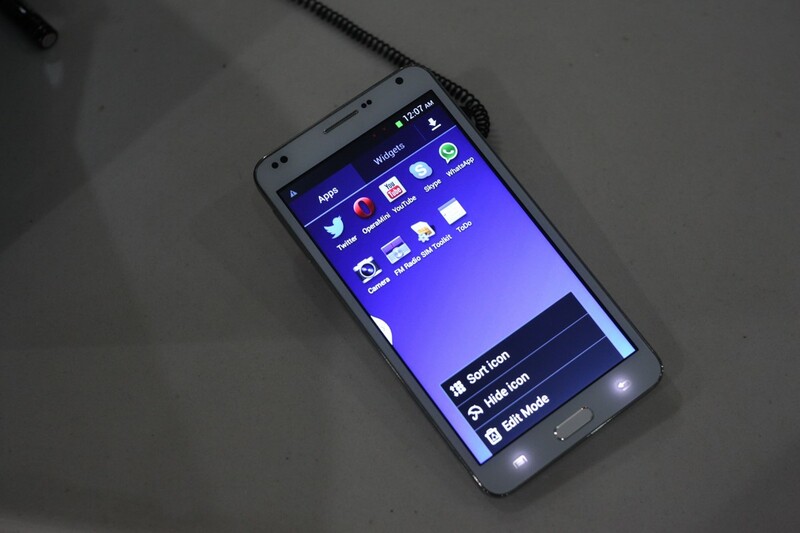 A leader in the operating system market Android, which took 72% market share against last year’s 20%. Apple’s iOS in second place with 13.9%, which has not changed significantly. The largest seller of Smartphones in the third quarter was South Korea’s Samsung Electronics, whose sales increased by 19% which is 98 million Smartphones in terms of numbers, while the total Smartphone shipments for the year increased by 47% which is 169.2 million units. Apple shipped 23.5 million iPhones in the third quarter. 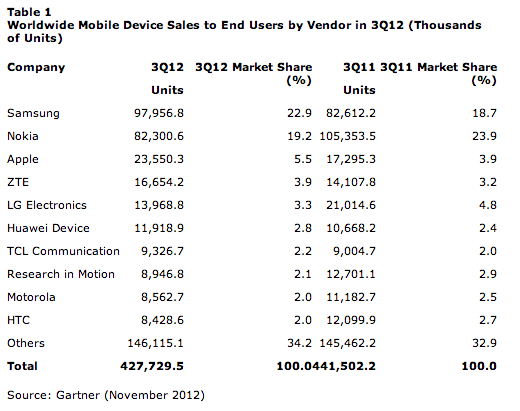 In the camp of Android-manufacturers, Samsung is the dominant player, obviously suppressing all other manufacturers. According to Gartner’s estimate,Nokia, HTC and Motorola Mobility, which are steadily losing market share amid growing Samsung. 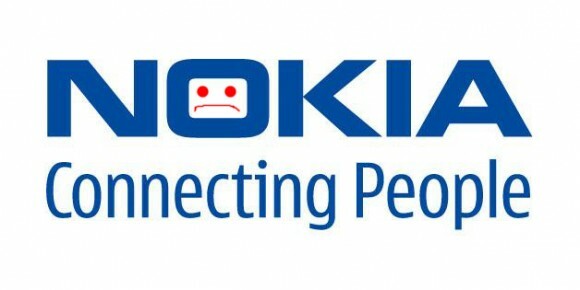 Nokia’s mobile phone sales declined 21.9 percent in the third quarter of 2012, but overall sales at 82.3 million were better than Gartner’s early estimate, largely driven by increased sales of the Asha full touch range. Nokia had a particularly bad quarter with Smartphone sales, and it tumbled to the No. 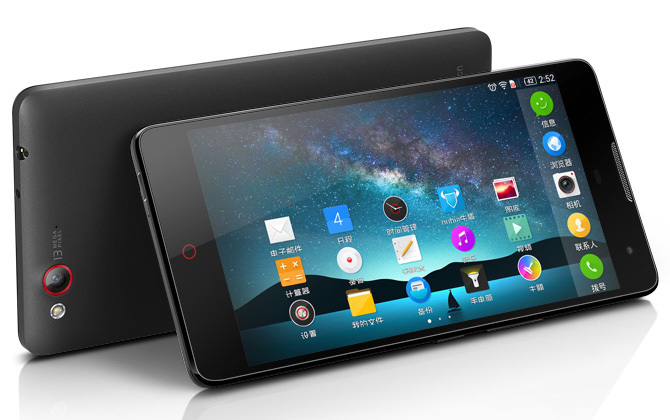 7 worldwide position with 7.2 million Smartphones sold in the third quarter. The arrival of the new Lumia devices on Windows 8 should help to halt the decline in share in the fourth quarter of 2012, although it won’t be until 2013 to see a significant improvement in Nokia’s position.